Blankbaby Reader survey: To beard or not to beard? Today was spent on the couch watching TV (and dozing off from time to time). I was going to venture forth to the gym, but the lure of the television (and the prospect of going out in the heat) thwarted that plan. That’s why I found myself in Wawa a few hours ago scoping out the ice cream case. Let me explain. I tuned in late, but I was able to watch as they narrowed the field from five finalists to the eventual winning flavor (there can be only one!). I was entertained enough to find out if the winning flavor, Sticky Toffee Pudding, was available at my local Wawa (getting fit be damned!). Off I went to Wawa to purchase dinner (a hoagie) and dessert (hopefully a pint of said ice cream). As I approached the ice cream case I saw my prey. It would seem that Sticky Toffee Pudding is selling pretty well because the good people at Haagen-Daz have not only given it a permanent place in their flavor lineup, but also made it a ‘Featured Flavor,’ whatever the hell that means. At this point I should mention I have never actually had the British dessert that this ice cream is based on, but I was willing to try it out for you, dear reader. rich vanilla ice cream swirled with sticky toffee sauce and morsels of moist brown sugar cake. Which sounds darned good to me. One of my favorite food combinations of all time is vanilla ice cream and cake, so how could I go wrong? I snatched up the only pint of the stuff Wawa had and ran home. I ate my dinner (you can’t have dessert until you eat your dinner, after all) and served myself 3 scoops of Sticky Toffee Pudding ice cream in a simple, white bowl. 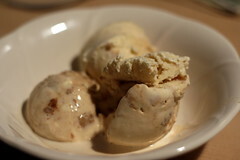 Sniffing the ice cream revealed a crisp vanilla aroma with a hint of spice (from the cake bits no doubt). I slide my spoon into a mound of the cold stuff, and slowly put it into my mouth. That first spoonful was soon followed by many more, until I was licking the bowl clean. This crap is good. The cake has a slight spice to it, and the toffee isn’t overpowering at all (as I feared it might be). Haagen-Daz makes a good vanilla ice cream, and since that’s this flavor’s base it only helps the overall taste (if you don’t like vanilla ice cream then this isn’t for you. You also might be a Communist). Some could peg this ice cream as overly sweet (it is sugar cake in sugary ice cream with a ribbon of toffee, so it is going to be a little sweet) but I didn’t find the sweetness to be too much for me. This ice cream strikes me as being the type best enjoyed by itself (much like myself). Putting it into a sundae or milkshake would be too much, since the added sweetness would push it over the edge. Enjoy this scooped into a bowl, and you won’t regret it. Interestingly, this isn’t the only flavor in Haagen-Daz’s lineup featured in last year’s Scoop competition, though it is the only one that advertises that fact. Another finalist is also being sold by Haagen-Daz in their new Reserve line of ice creams. Toasted Coconut Sesame Brittle was a judge favorite, but it would seem the public (which picked last year’s winner) liked the Sticky stuff more. Luckily, you can get yourself a pint of the judge’s favorite now too, if coconut is your thing (it isn’t mine, so I am glad that it didn’t win the competition). Sadly, the third of the top three finalists in the Scoop competition doesn’t seem to be on sale anywhere. Canoli flavored ice cream, it would seem, will remain unavailable for most of America (unless you make your own, but it would probably be easier to just buy a regular canoli). Now, if you'll excuse me I have the remainder of a pint of ice cream to devour.